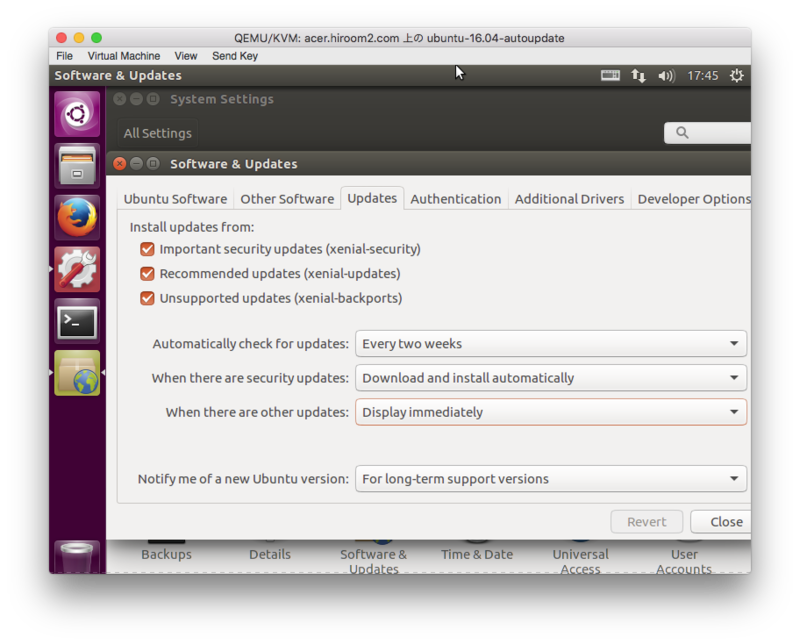 This article will describe auto apt update and apt upgrade with unattended-upgrades. There is a issue with freezing apt update. After installing Ubuntu 16.04, apt update and apt upgrade will run on boot and every day at 6:00 and 18:00 automatically. And only security upgrade will be applied. Framework for running apt automatically. An unattended-upgrades will be called by apt.systemd.daily. This will run apt update and apt upgrade. Config files are /etc/apt/apt.conf.d/20auto-upgrades and /etc/apt/apt.conf.d/50unattended-upgrades. An unattended-upgrades does not use this file. apt-daily uses 10periodic and 20auto-upgrades. 20auto-upgrades's value will be overwritten to 10auto-upgrade's value. Config enable, disable and timing of unattended-upgrades. Below means that auto update will be run every day, and auto upgrade will be run when there are update packages. "Software Update" provides GUI setting. Below 20auto-upgrades will be created. Selecting upgrade package. Only security upgrade is selected by default. If you want to select other upgrade, you need to erase comment '//'. You can prevent dpkg lock by apt-daily and apt-daily-upgrade. Reboot time is enabled by Unattended-Upgrade::Automatic-Reboot and Unattended-Upgrade::Automatic-Reboot-Time in 50unattended-upgrades.